People may have judged her and teased her, but in Florence Foster Jenkins' mind, she has the most beautiful and perfect voice that an opera singer must possess. It showcases a value that everyone must be heard, no matter how awful your voice or opinion would sound like. The movie is about the enchanting, sometimes comedic, and sometimes melodramatic, biopic of one most popular socialite during her time, "Florence Foster Jenkins". The film and Jenkins' life story as it was unfold is a whole new level of an "Emperor's New Clothes"-story. It has lies from beginning to end, but it's quite enjoyable to watch especially the three main actors Hugh Grant, Simon Helberg, and Meryl Streep as the title role. Florence Foster Jenkins' life is as colorful and imeldific as you can imagine. She was ambitious but free spirited, and her life is surprisingly entertaining to watch. Meanwhile, the movie inspired little ambitions to become big dream. Singing in the famous Carnegie Hall and performing in it even if you have an awful voice is really an achievement to beat! Not to mention Florence did it with flying colors by having series of concerts and performances inside Carnegie Hall. What most sadly though was that Florence Foster Jenkins had to live a world of lies, which by the way she has no idea what's really happening in the world because what she knew in her mind was not the reality itself. Anyway, Florence Foster Jenkins is one of those movies to watch this week for that Gatsby-look and feel and of course, Meryl Streep! Overall, we enjoyed watching "Florence Foster Jenkins" and we give them a 9 out of 10 movie experience for Meryl Streep's presence and performance and for an informative and enjoyable movie plot. 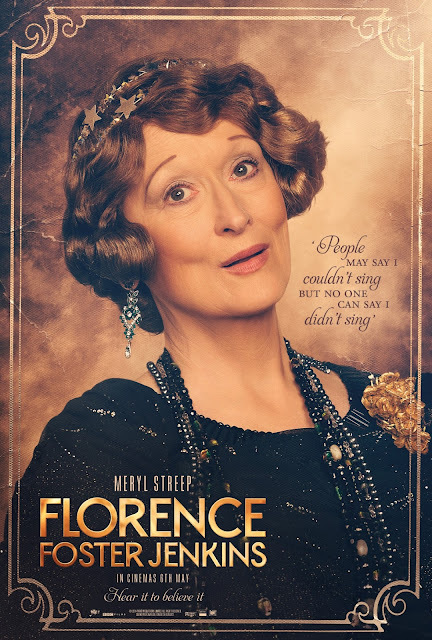 "Florence Foster Jenkins" is released by OctoArts Films International in the Philippines. Watch "Florence Foster Jenkins" full movie trailer below. Enjoy!